Mäleta mind · Logi sisse Unustasid salasõna? 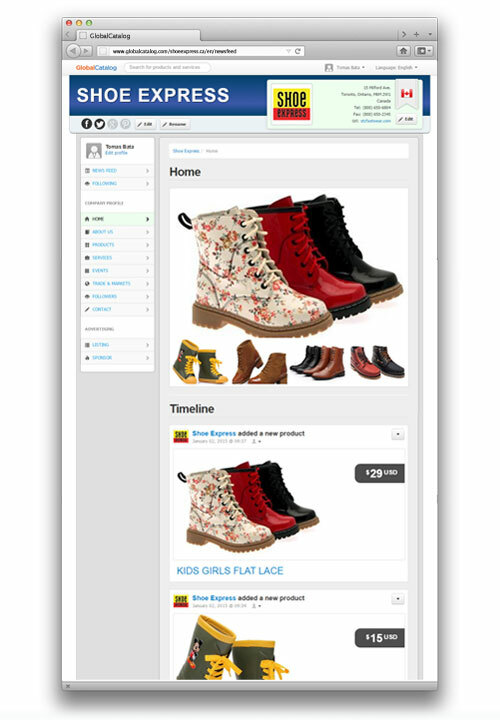 Build your business network on Global Catalog. Invite businesses to network with you, connect with them and share your important business information. Share what's new in your company. 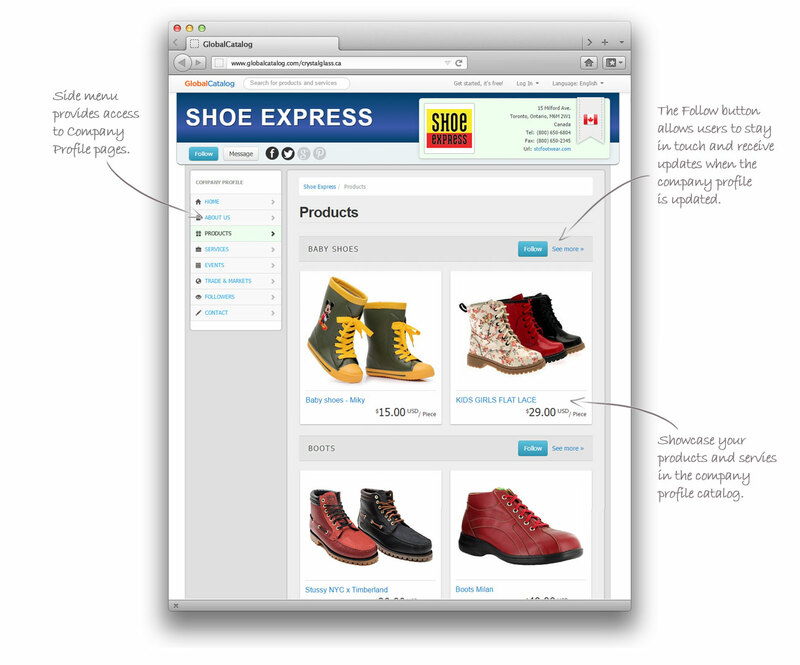 Keep your Followers informed when you introduce new products, post reports or news releases. Invite followers to your events or inform them about special deals. See what other businesses are doing. Follow other businesses to learn about their new products, services, events or special deals. First Step: Create a profile for your business. Your Company Profile shows the world what you are doing. There is an ocean of potential customers out there who will follow your company if you regularly update your profile with latest business information, events, products and services. 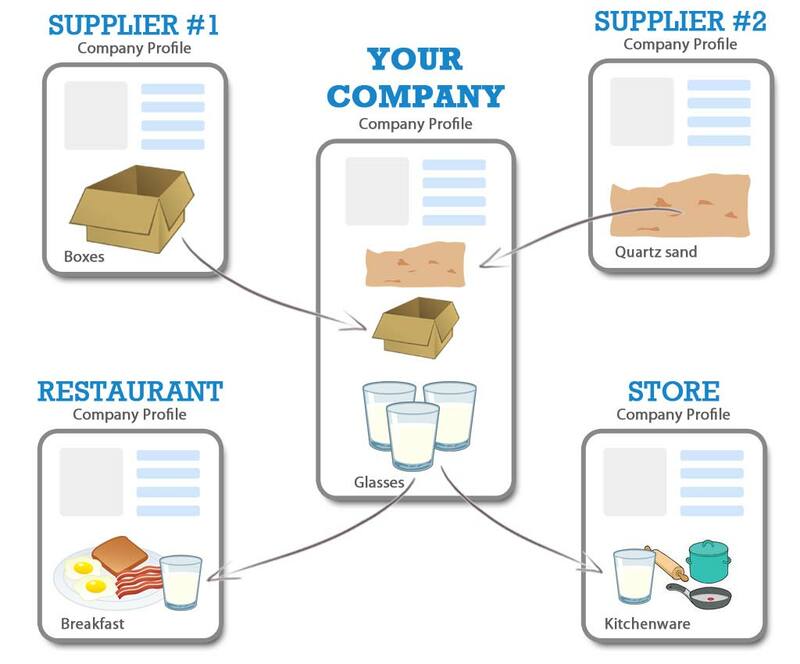 Every element of your Company Profile—information about your products, trade and market, company events or other company information — should reflect your business identity. Use them to showcase your business. It takes you less than 5 minutes to create your Company Profile. Easy posting and managing your business information. You are in full control of your business information. Second Step: Connect with businesses. Invite businesses to network with you. Connect with businesses directly to the information you and they need. Connect your Company Profile with profiles of your existing business partners, or other businesses by clicking the "Follow" button. You can follow all information about a company (events, special deals, etc) or individual products. 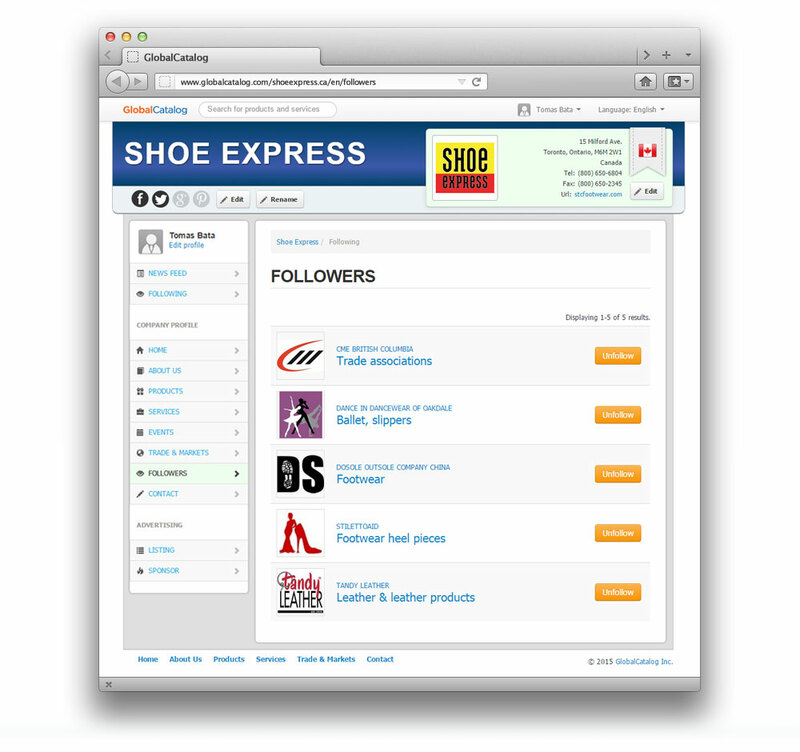 Find the right companies on Global Catalog or invite your existing businesses partners to become your Followers. You choose, who will follow your business information in your Company Profile. You decide, what updates and post from other businesses you will follow. Final Step: Share and follow business information. Make a final step to network with businesses. Share your businesses information and follow other businesses to see what they are doing. Instantly share your important business information like new products, events, reports or news releases with your FOLLOWERS on the HOME PAGE of your Company Profile. Invite your followers to your events or inform them about special deals. See what's happening with other businesses. 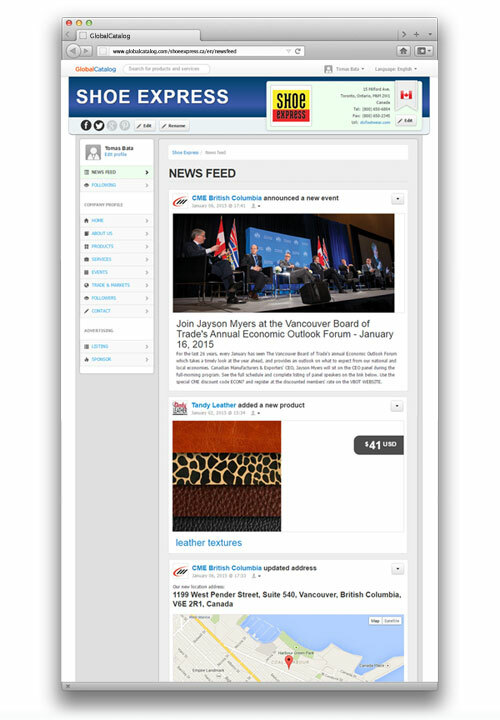 Use the NEWS FEED page to watch live updates about new products, services, events, special offers, business requests of the companies you FOLLOW. Posting updates and managing your business information is very easy. You decide which posts appear on your Home page. Grow your business with Global Catalog the fastest growing business network. Whether you are a small business owner or a large corporation, Global Catalog gives you the business networking tools that can benefit you immediately. be part of business network used by millions of companies in 195 countries and 55 languages. network with other businesses to build a closer relationships and a community of high value followers. gain relevant followers who can help your business extend its reach, drive sales and generate word of mouth referrals. 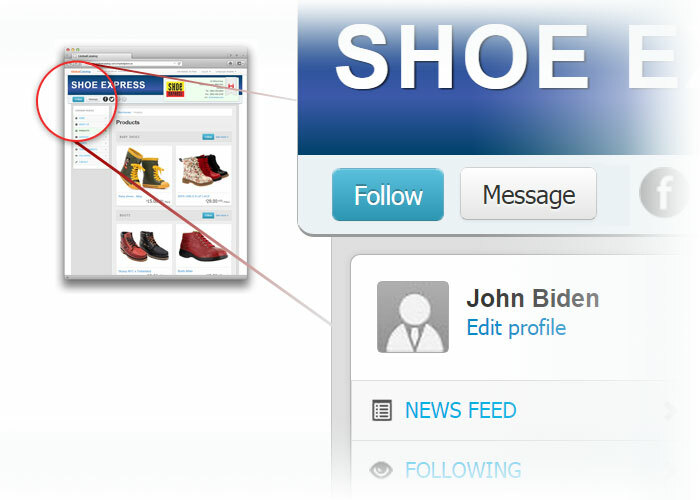 keep your followers instantly informed, when you update your profile information. increase the local and global visibility of your business. get your business in front of companies and people. sell more products & services. enables your business to grow your markets and profits. Get started networking with other businesses. Share your businesses information or follow other businesses and see what they are doing. It’s free to join and free to use.